Many of our customers have Irish roots – we have to share our joy with you. Queen, an exceptional octogenarian, was most gracious and relaxed and she and her husband seemed to truly enjoy the four day visit. She addressed a Dinner in Dublin Castle, the former centre of British rule in Ireland and in her opening words spoke “Gaelic” addressing the audience as ‘A Cairde – Friends’. The whole event was timely and Her Majesty acknowleded the past difficulties of 800 years of colonisation (which ended nearly 100 years ago); the success of the peace process in Northern Ireland; and went on to discuss “our mutual ability to bow to the past but not to be bound by it”. The success of the visit which included a visit to County Cork formerly known as the ‘Rebel County’ – was such that, County Cork has now been rebranded as ‘The Royal County’. Cork based Minister of State Kathleen Lynch said the greatest benefit from the visit would be felt by the Irish community living in Britain who, she said ‘had lived for 30 years in the shadow of the troubles’. The visit was not about a “doffing of the cap or a bending of the knee’” she said , but, rather was a demonstration of the increasingly warm and friendly relations existing between equals. “People are happy, not just with the Queen’s performance but also with our performance. Britain is our nearest neighbour, home to most of our emigrants, our biggest trading partner. Up until now, we couldn’t do this. Today I think we have moved on and that’s very welcome. 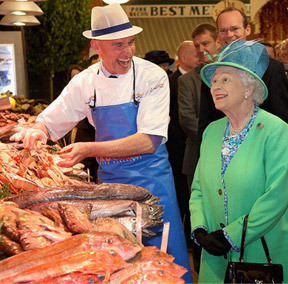 On Monday May 23rd Her Majesty back in the UK made a trip to the Chelsea Flower Show when asked by an Irish Reporter if she had enjoyed her visit to Ireland, Her Majesty responded ‘It was brilliant’!.